NEMO Equipment of Dover, N.H., is recalling about 7,500 Stargaze recliner chairs. Some 15,500 were recalled in February 2018. The plastic joint supports attached to the legs of the chairs can break, posing a fall hazard. The firm has received 14 reports of the joint supports breaking. No injuries have been reported. 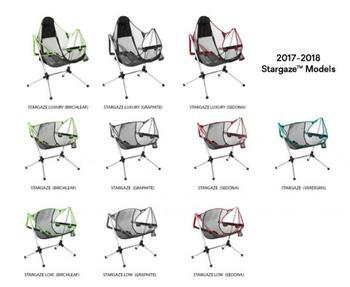 This recall involves the Stargaze Recliner, Stargaze Recliner Low, and Stargaze Recliner Luxury lifestyle camping chairs. The portable swinging and reclining outdoor chairs have an aluminum frame and black and gray monofilament mesh seat, and weigh between five and seven pounds. They were sold in four colors: birch leaf green, graphite, verdigris (teal) and Sedona (red). They come in a black, padded carrying case, and are used as a portable seat for camping and outdoor activities. The model name is printed on the pocket on the inside right side of the seat. The NEMO name and logo is attached to the back of the seat as a stitched logo. The three manufacturing lots included in this recall are marked with November 2017, December 2017, March 2018 or May 2018 date codes. The date code can be found on the plastic hub located on the inside edge of the leg strut. The date code is in a clock format: The numbers around the circle correspond to the 12 months of the year, the arrow points to the month of manufacture and the numbers on either side of the arrow represent the last two digits of the year. The chairs, manufactured in China, were sold at REI and specialty outdoor stores nationwide and online at Nemoequipment.com and REI.com from November 2017, through May 2018, for between $180 and $220. Consumers should immediately stop using the recalled chairs and contact NEMO Equipment for a free inspection and, if necessary, a free replacement chair. Consumers may contact NEMO Equipment at (800) 997-9301 from 9 a.m. to 5 p.m. (ET) Monday through Friday, by email at journey@nemoequipment.com, online at www.nemoequipment.com and click on Product Recalls for more information or www.nemoequipment.com/product-recalls/stargaze-recliner-hubs/.